The P-51D was undoubtedly the best day fighter the USAAF had during WWII. It was built in huge numbers and was so effective, that even after production ceased at the end of the war, the type remained in service. So many were around that it was exported in the hundreds with a goodly number of air arms sporting Mustangs in front line service. They were inexpensive to buy and while not as fast as the new jets, were not as complex and easier for many air forces to maintain. The USAAF and later USAF saw that this was a plus. These aircraft filled ANG fighter interceptor squadrons as well as a number of regular Air Force units. With the coming of the war in Korea, there were plenty of Mustangs, now redesignated F-51D, in the Far East Air Force and a supply line was already in place so this was what was used for fighter and ground attack missions. Despite the fact that the P-47 would have been a better choice for a fighter-bomber, it was logistics that made the choice to use the Mustang. Mustangs were also operated by the South African Air Force and also by the South Korean Air Force, albeit with the latter having some help from USAF personnel as they got things going. 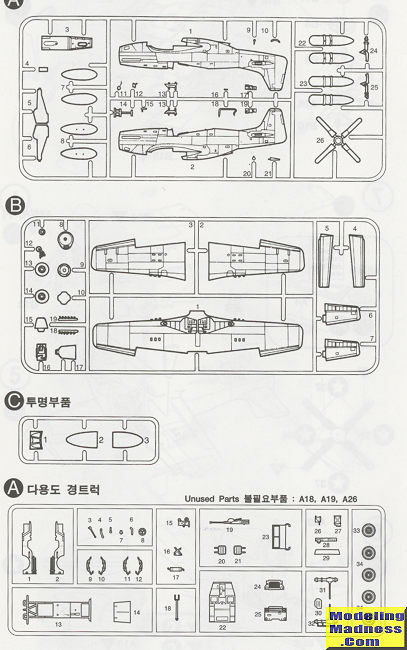 Pretty much every kit maker has produced a Mustang of some sort and it was quite logical for Academy, a South Korean company, to add one to their catalogue. I obtained this one from a batch buy on an on-line auction site with some other kits that include the Nate that was recently a feature build. The Academy kit is everything one would want in a current kit with nicely engraved panel lines, decent interior detailing and a goodly selection of markings. Some of the features of this one in addition to a well appointed cockpit are separate flaps that can be shown lowered, a separate windscreen and canopy so you can post the canopy open, as well as a choice of drop tanks. The kit does come with two canopies including the later Dallas canopy. Now this is where things get a bit off. You see, This is pretty much a standard WWII Mustang. Post war planes would have had rocket rails and during Korea they would have had bombs. Neither are included. The kit also has a WWII era cuffed prop. Many Korean War F-51Ds had an uncuffed Hamilton Standard so check your photo references. So in all honesty, you cannot use any of the markings options provided unless you can find a photo that shows one of the three options without rocket stubs and with a cuffed prop. To make up for it, this boxing includes a very nicely done Jeep, so you do get a bonus and you can always use aftermarket decals for your Mustang and save the kit decals for a proper post war representation (such as the Tamiya or Airfix F-51D kits). 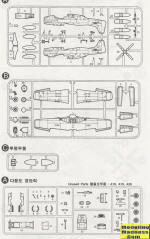 Instructions are well drawn with generic paint references. Two of the planes are from the ROK Air Force and one is a USAF plane with black bands on the wings. The decals are nicely printed and in register. It is a bit disappointing that you cannot really build what is stated on the box, but this does look like a very nice kit no matter how you slice it. The addition of the Jeep makes for a nice bonus. This may well have been a limited release boxing as attempts to find one via a 'net search did not turn one up. So if you like Mustangs and can get over the mis-labeling this would be a good one to locate.